LAHORE - Media Times, a media group, on Friday fired more than 200 employees from its two organisations; Urdu newspaper Daily Aaj Kal and its satellite TV channel Business Plus. The group had been facing extreme financial constrains; employees were not getting salaries; there was at least a four months lag. Aaj Kal Editor Khalid Chaudhry was also shown the door, Pakistan Today has learnt. More than 150 employees of Aaj Kal and Business Plus were sacked from their Karachi office, 43 from Lahore and 40 from Islamabad. The employees were told to collect one month salary and wait for their final settlements. Media Times has been under financial pressure for the last three years and time and again it sacked a number of senior and junior employees because of monetary issues. The employees were often pacified but things only turned worst with the passage of time. The sacked staff, condemning the decision, protested in front of the Lahore Press Club and appealed the journalists’ associations to intervene and take up the issue on the national level. “It is not the way to behave with your employees,” said one of the sacked employees. 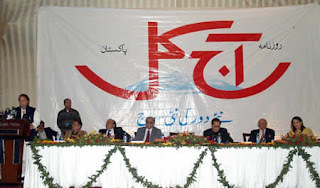 IT STARTED WHEN…: Late Salmaan Taseer established English newspaper Daily Times in 2002 and Najam Sethi was made its editor. Later, Media Times launched satellite TV channel Business Plus in 2005. Things were progressing fine until the launch of Urdu newspaper Aaj Kal.